Below you will find instructions how to set up and use this feature. I read about this sometime ago, and since that time, searching now produces all sorts of instructions on this. Some good some bad, I hope this will be one of the good ones. I am giving the the command line way to set this up, apparently there is a thing you can download now to do this. Connectify and Connectify PRO, The pro version is $29.95. Why would I want to download more stuff and give someone $29.95 when I can can accomplish this in a few easy steps? I wouldn't and here is how to accomplish this. After researching this again recently, I have found different conflicting ways to accomplish this, I have tried a few different ways, the instruction below is how I accomplished this with my PC. Results my vary, depending on your PC setup, In this guide I am using Windows 7 32 Bit Ultimate Edition, with complete administrative rights. Some older Wireless Network cards will not install the Virtual WiFi Miniport Adapter, most newer Wireless NIC cards will install the adapter if the drivers are installed from the manufacture. If the Vwifi adapter is not available you will need to have this installed before proceeding. Your PC must have a Wireless NIC card installed to be able to Broadcast a signal. Continuing to read and attempting the following instruction, you accept this web site and its owner is in no way responsible for any damage that might occur to your PC, Network Interface Cards, Network Components, Servers, or what ever Device might have a problem in the future. If you do not agree to take responsibility for your actions, Please Leave Now. Before we begin, two things that are helpful to have open Command Window and Notepad. On the Left side menu, Choose "Change Adapter Settings". Once Open you should see all available Lan, Wlan adapters. The PC must have Microsoft Virtual WiFi Miniport Adapter installed it will appear in the list of adapters if available. Right click on the adapter which is used as your internet connection, Lan or Wifi Adapter ( do not select the Virtual wifi adapter ) choose Properties at the bottom of the Pop up Menu. 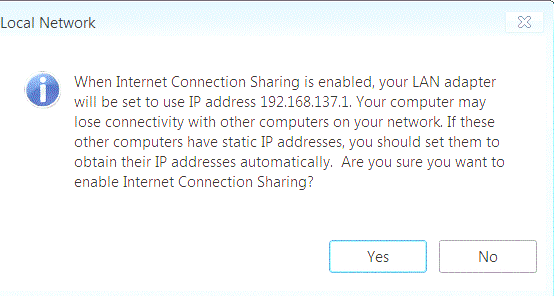 After clicking Ok, you might get the pop up message about your adapter changing, this is the default Shared IP address, which will be assigned to the adapter. Click Yes. Close the Adapter settings Proprieties box. I recommend minimizing the "Network and Sharing Center" window to the task bar as we will need to Open again later. Click Start (windows menu Button) type in the search box type CMD and a command window should open. My User account is set up as Administrator, I can not verify if one needs to be Admin to do this? If you find you do need to be administrator, go to C:\Windows\System32\cmd.exe Right click on CMD.exe and select Run As Administrator. Once Cmd window is Open a Black Window should appear. Below in red text is what is need to set up and start the service. Change only these two parts in the string, Broadcast Name "SSID=Mickspacenet" and Password "key=mypassword"
Following the SSID= change to what you would like your Broadcasting name to become. Following the key= change to what you would like your Key or password to be. If you do not change this and simply copy and paste these lines your ssid and key will be what is shown here. Once you changed to what you like, copy and paste to the CMD window. Once copied, pasted into Cmd then press Enter, you should receive the following. Your Vwifi is now set up and almost ready to use. Now we have to start the service. Paste this line into the Cmd Line. This will start the service. You should receive the following message. C:\Windows\System32>netsh wlan start hostednetwork The hosted network started. Your Vwifi should now be broadcasting. the Show command will show you details such as How many clients are connected, SSID etc. The Microsoft Virtual Wifi Miniport Adapter should show what ever it is you named the SSID. From a device or a different PC, attempt to connect to to your new broadcasting network. Below are a few commands which control the "netsh wlan" Command. This will stop the network broadcasting. This will show the security Key. Once this is set up and you are able to connect, the PC will save the settings, in the future if you want to to start or stop the service, simply do the start or stop command or Disable the Virtual Miniport Adapter in Network and Sharing Center. The alternative to starting and stopping the service is creating a bat file or a short cut. I have created a Two short cuts, one to start, one to stop. You can download that below here. This worked beautifully on my PC there is no grantee this will work on your PC. You can how ever make your own short cut, in the Target entry place this line to start the service-" C:\Windows\System32\netsh.exe wlan start hostednetwork " Place this line to stop the service -" C:\Windows\System32\netsh.exe wlan stop hostednetwork "
"netsh wlan" is the command we used here, typing "netsh wlan help" shows help information. all the commands here are preceded by "netsh wlan"
add - Adds a configuration entry to a table. connect - Connects to a wireless network. delete - Deletes a configuration entry from a table. disconnect - Disconnects from a wireless network. export - Saves WLAN profiles to XML files. refresh - Refresh hosted network settings. reportissues - Generate WLAN smart trace report. set - Sets configuration information. start - Start hosted network. stop - Stop hosted network. show all - Shows complete wireless device and networks information. show allowexplicitcreds - Shows the allow shared user credentials settings. show blockednetworks - Shows the blocked network display settings. show drivers - Shows properties of the wireless LAN drivers on the system. show filters - Shows the allowed and blocked network list. show hostednetwork - Show hosted network properties and status. show networks - Shows a list of networks visible on the system. show profiles - Shows a list of profiles configured on the system. show settings - Shows the global settings of wireless LAN. show tracing - Shows whether wireless LAN tracing is enabled or disabled. For more Details and Help Google " Netsh Commands for Wireless Local Area Network (WLAN) "